This article is excerpted from Dr. Gladis Zinati’s field guide, Invite Insect Allies to your Farm Using Insectary Strips: Field Guide to Control Striped Cucumber Beetles. Download the full PDF here. For a description of our research and results, click here. Permanent habitats are pesticide-free zones or landscapes within and/or along arable fields that offer suitable habitat for beneficial insects. These habitats include meadows, hedgerows and flowering insectary strips. This article focuses on insectary strips to target the striped cucumber beetle (SCB). For more information on our research on eliminating SCB, click here. 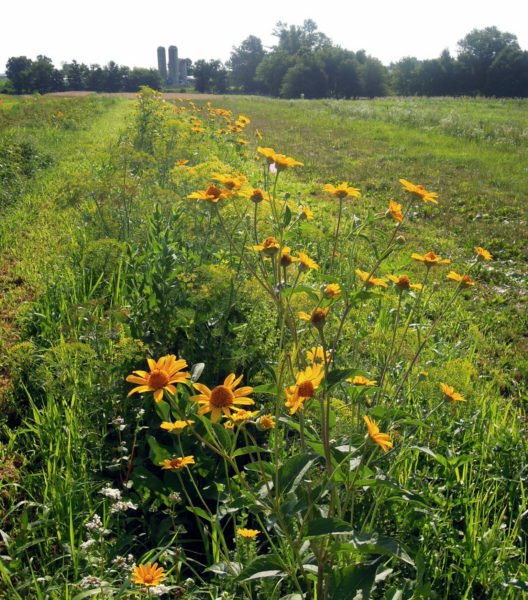 Flowering insectary strips are a conservation biological control approach that provides supplemental nectar, pollen, and habitat to improve the performance and survival of natural enemies while enhancing the rate of parasitism and predation of all life stages of striped cucumber beetle pest. What follows are key considerations for designing, selecting and maintaining insectary plants and key findings from a two-year research project on the uses of insectary plants for enhancing populations of certain beneficial insects that target SCB. Insectary flowering plants are plants that are grown to attract, feed, and shelter beneficial insects that aid in biological pest control at the farm. Insectary plants can be a combination of perennial and annual flowering plants. 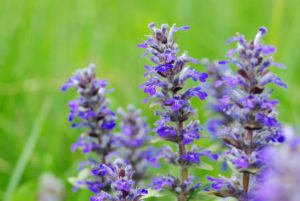 Flowering plants are particularly important to adults of natural enemies of the SCB, such as wasps and flies, which require nectar and pollen sources to reproduce the immature larval stages that parasitize or prey on insect pests. Similarly, bees and plant pollinators take advantage of nectar and pollen and use the plants as shelter. Deliberately design insectary mixtures that effectively support targeted natural enemies and avoid insectary-plant species that host arthropod pests or plant pathogens that can move to damage nearby crops or ornamentals. It is important to first collect information on and/or consider some biological and farm management factors when planning for insectary plantings. Growing the right combination of plant species that flower sequentially throughout the year will provide continuous shelter and feed sources. Choose plant species that are compatible with the growth of other desirable plant species and well-adapted to your soil and growing environment. Provide the best possible growing conditions, including adequate water, nutrients and sunlight. For drought-tolerant conditions, Rocky Mountain Penstemon (Penstemon strictus), a native perennial insectary plant belonging to the Plantaginaceae family, has showy violet-blue flowers on tall stems that blooms in June. These flowers attract hoverflies, ladybugs and bees in addition to hummingbirds. Goldenrod (Solidago spp.) is another native drought-tolerant perennial plant and belongs to the aster family. 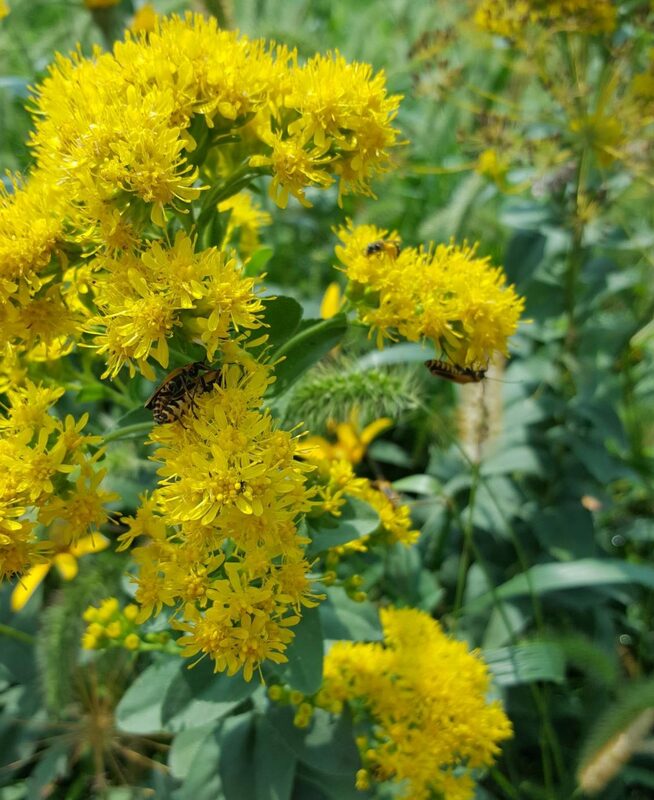 It produces bright lemon-yellow flowers in August through September in Pennsylvania, providing nectar for beneficial insects such as the Pennsylvania leatherwing soldier beetle (Chauliognathus pennsylvanicus). The females mate once in early summer and lays eggs in the soil, where larvae feed on the eggs and larvae of striped cucumber beetles and other insects, while the adults feed on pollen, nectar and aphids. Other beneficial insects attracted to this plant are ladybeetles and wasps. These plants are easy to grow. Seed them in rows 6-8 weeks before the last frost date. They are hardy in zones 4-9. In moist-tolerant soil conditions, include insectary plants that belong to Asteraceae family such as marigold (Tagetes tenuifolia), which attracts minute pirate bugs and wasps in addition to bees. 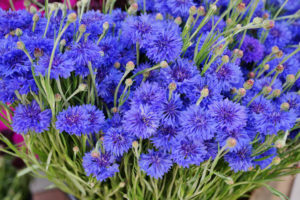 Bachelor’s button or cornflower (Centaurea cyanus) has leaves that release nectar even when the flowers are not blooming. This nectar is attractive to ladybeetles, lacewings and wasps. 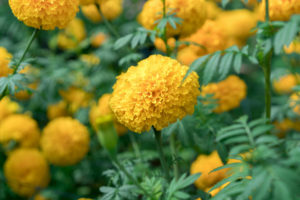 The plant is easy to grow either in fall or early spring. It reseeds itself every spring. Certain crops including edible landscapes and aesthetically pleasing ornamentals can serve as insectary plants. For small-scale production (garden size and less than a quarter of an acre) planting small patches or “islands” of flowering plants around the crop-growing area will provide shelter and feed for beneficial insects. However, for large scale farm production, larger and more interconnected patches of resource are better than small patches. For large-scale agriculture, strip intercropping may be more suitable than mixed intercropping. Strip intercropping is where two or more crops are grown together but in separate rows to reduce restrictions on cultivation, whereas mixed intercropping is where two or more plant species are planted in random order. You may arrange the planting pattern by interplanting insectary plants in strips of 3-5 feet wide for every 6-8 rows of cash crop or including a border of flowering plants on one side of the field. 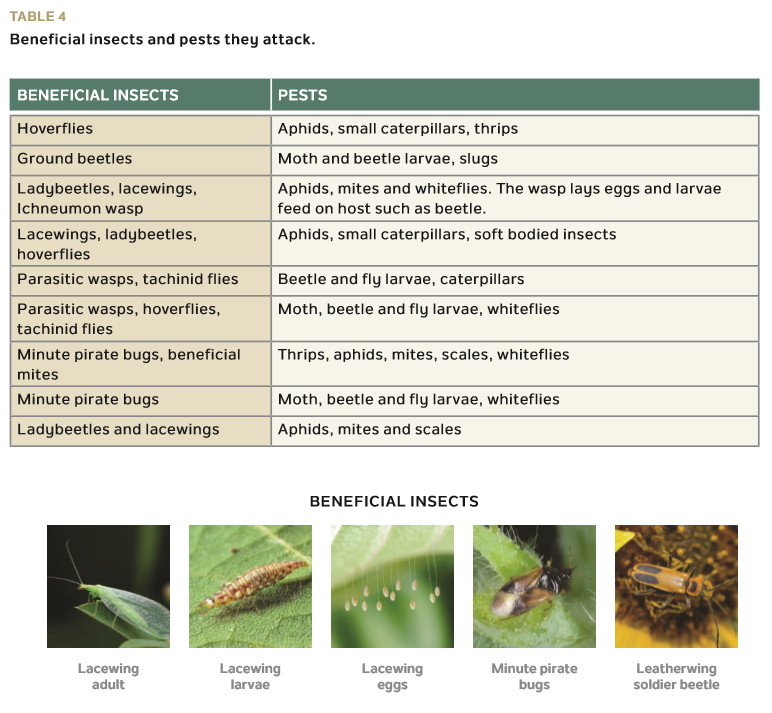 However, the latter pattern may limit the dispersion of beneficial insects especially those with low dispersion capabilities such as lady bug, ground beetles and parasitic wasps (see Table 1) compared to hover flies, syrphids and tachinid flies that can disperse beyond ¼ mile distance. Due to differences in mouth part size and structure of beneficial insects, not all flowers are equally accessible to all insect species. Planting a mixture of plant species with diverse flower sizes and shapes (e.g. tubular vs. disk), colors, and blooming periods attracts and maximizes the abundance and diversity of beneficial insects. Select plant species that are inexpensive, readily available, and easy to grow. Choose plants from different families with different heights, shapes, sizes, and foliar and flower types. The floral structure is an important consideration in planting insectary plants. Flowering plants with upright, stalky structures and long bloom periods provide ideal habitat for insect predators. 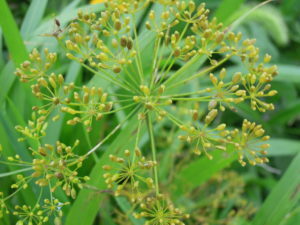 For example, when allowed to bolt, lacy plants with flowers of umbel shape (Apiacea family) such as coriander, dill, fennel, parsley, and Queen Anne’s lace, have upright stalks with tiny, shallow flowers. These provide easy access to pollen and nectar, favored by predatory flies, tiny parasitic wasps, lacewings, and ladybugs. Researchers have shown that insect predator abundance increases with increasing density of inflorescences (cluster of flowers on a branch) and extrafloral nectaries. Extrafloral nectaries are glands located outside of flowers that secrete nectar, a sugar-rich liquid, as a source of energy. Plants that possess extrafloral nectaries such as fava beans, cowpeas, vetch, sunflowers, and several native ground covers, serve diverse ecological functions by providing beneficials with easy access to an important food source in addition to the nectar and pollen of their flowers. In particular, tiny predatory flies and wasps spend more time on plants with nectar and pollen, used as source of food and energy, for reproducing immature larval stages that feed on plant pests. Consequently, a higher rate of parasitism of host pests in the area is expected. Sites with flowering plants that don’t provide sufficient food for parasitoids (parasitic wasps and flies) will force the insects to disperse from target areas in search for food and thus the rate of parasitism of host pests will decline. 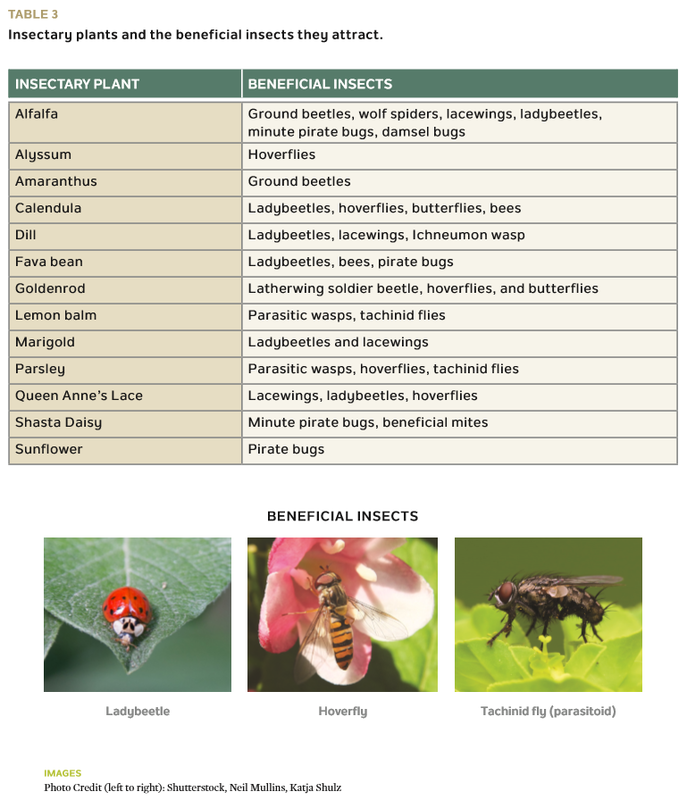 Refer to Table 2 at the end of this article for a list of plants that attract beneficial insects. 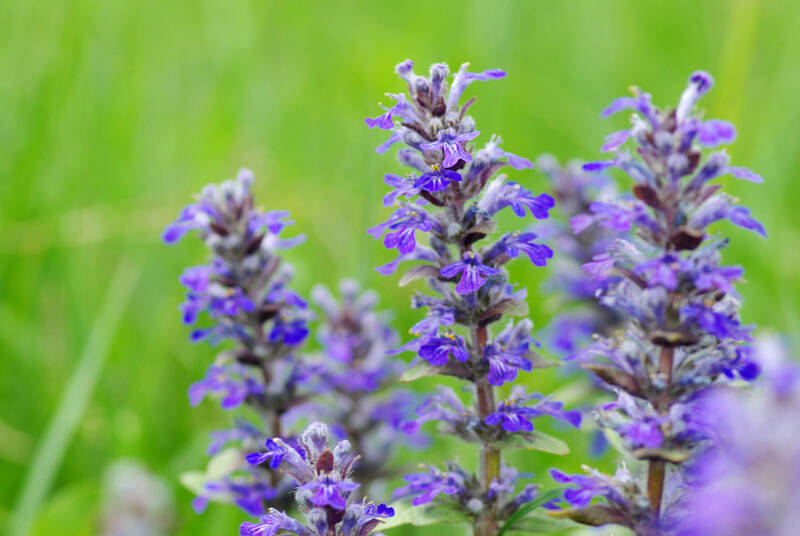 Perennial flowering plants with strong scents and flavors and showy, bright-colored flowers are known to attract beneficial insects. For example, lemon balm is a good tea herb with lemon-scented leaves and its flowers attract tachinid flies, tiny parasitic wasps, and hoverflies. 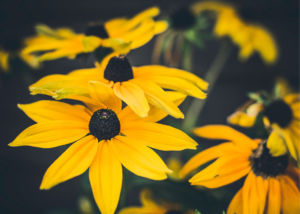 Black-eyed Susan is another perennial flowering plant with golden-yellow, daisy-like flowers. 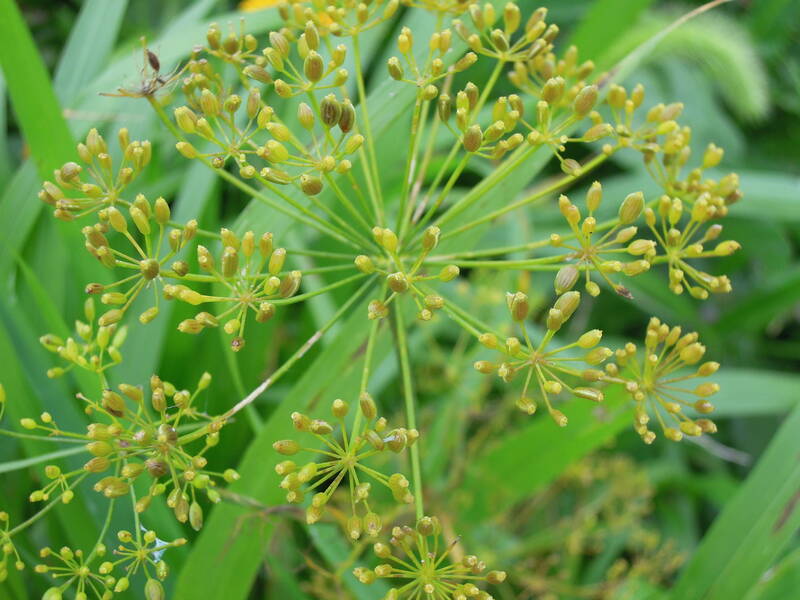 Upon blooming, the plant leaves produce scent that attracts lacewings and bees. Refer to Tables 2 and 3 at the end of this article for more information on scented plants and the types of predators they attract. In designing insectary strips and patches, consider including plants that attract not only flying beneficial insects but also soil-dwelling predators such as ground beetles and wolf spiders. These insects are nocturnal predators that feed on the eggs and larvae of pests—especially those of the striped cucumber beetle. Researchers documented that predators like wolf spiders have been shown to feed heavily on striped cucumber beetles in cucurbit crops. Just presence of such spiders cause SCB to avoid feeding on the crop even when the spiders do not actually kill them. 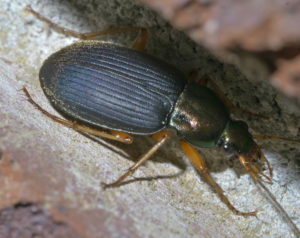 Ground beetles feed on adult cucumber beetles. Thus, a diverse community of predators may be important for biological control of cucumber beetles rather than relying on any single predator species. 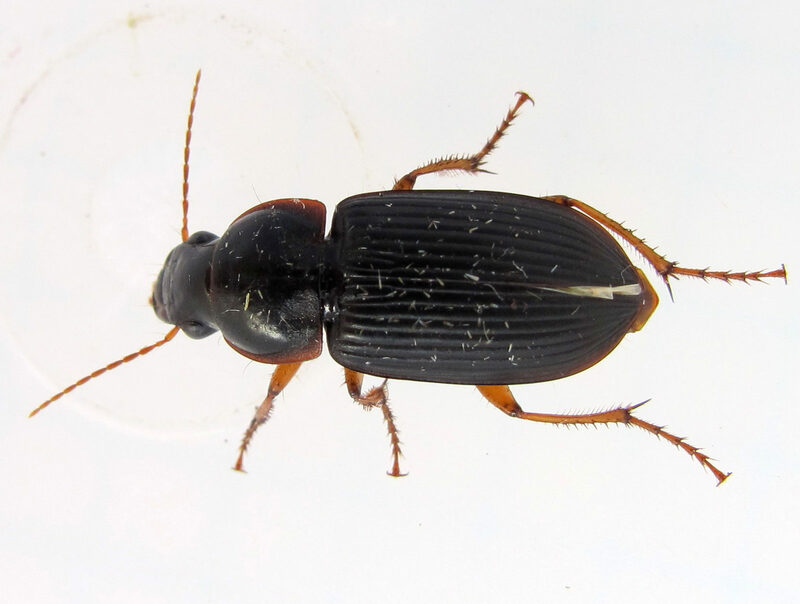 Ground beetles are a diverse group of insects with 2,000 species inhabiting North America. 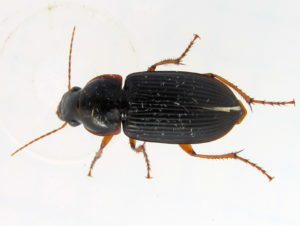 Adult ground beetles range in size from about 1/8 inch to 1 ¼ inch (2mm to over 35mm). The long legs of ground beetles allow them to move rapidly to capture prey and avoid other predators. They are opportunistic feeders and feed on aphids, moth and beetle larvae, caterpillars, plants, and weed seeds. However, prey preferences can change throughout their life cycle based on nutritional needs or a change in the resources or environment. Their habitat includes meadows, crop fields and woodlands. They hunt at night and climb plants to find prey. 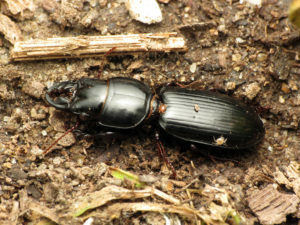 During the day these beetles can be found under logs, stones, and leaf litter. 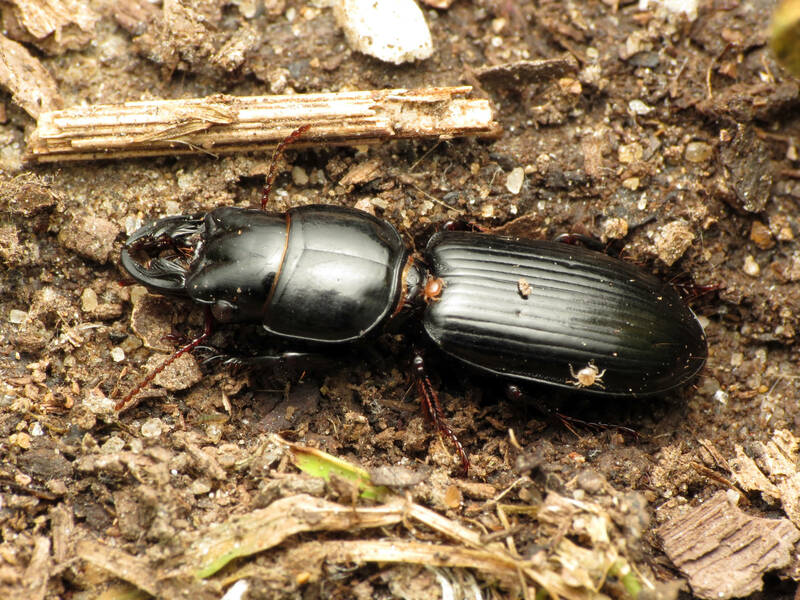 To encourage and maintain ground beetle population, provide dark, damp, and sheltered habitat. Start by seeding alfalfa, a perennial leguminous plant, in rows within the insectary strips in the fall. In spring, plant/transplant annuals and perennial flowering plants into the insectary strips. Alfalfa will grow and cover soil surface between flowering rows and serve as a shelter for ground beetles. Wolf spiders are members of the family Lycosidae. These spiders are often big, ranging in size from 5/64 inch to 1 ¼ inch (2 mm-35 mm), and hairy, which alarms some people, but they are primarily nuisance pests. Over 100 species of wolf spiders are found in the United States and Canada. Most wolf spiders are nocturnal although some do hunt during the morning. 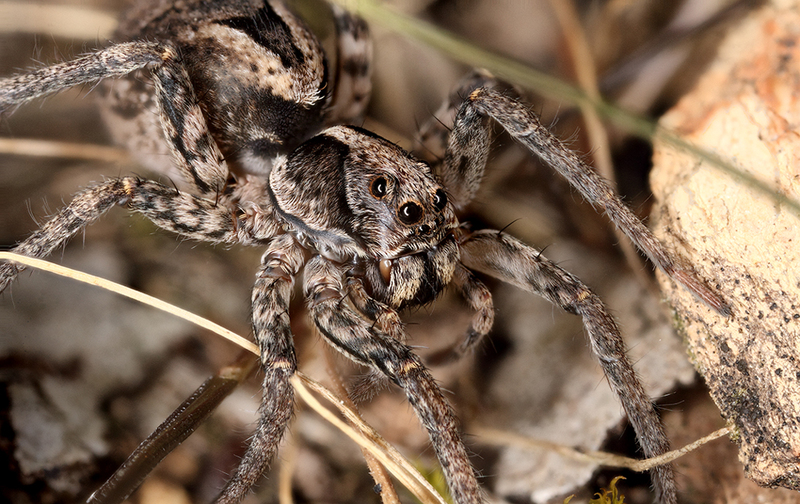 Unlike most spiders, wolf spiders are solitary creatures that hunt without forming webs. They actively chase their prey on the ground or on plant foliage using their fast running ability at night. Mulches from rolled or cut leaves and stems, cover crops, grass clippings and leaves at base of shrubs are considered suitable habitats for providing shelter and food source for attracting and maintaining a population of wolf spiders. needs for installation and maintenance should be included as key considerations in designing the insectary. Another key factor is weather. In designing the insectary, consider a flexible approach in order to adjust beneficial habitat according to weather variations. Include in the planting mixture diverse plant species that are tolerant to drought, heat and wet feet. Many perennial insectary plants can be sown in the fall about 6-8 weeks before first frost. Annual flowering and herbaceous insectary plants can be either transplanted or sown directly in the spring. Those that bloom early in spring to attract beneficial insects may be started in the greenhouse and transplanted early into the insectary strips. 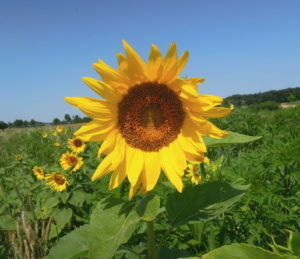 Those that bloom during the summer and early fall can be sown in rows into insectary strips soon after the soil is workable in spring (April- May). 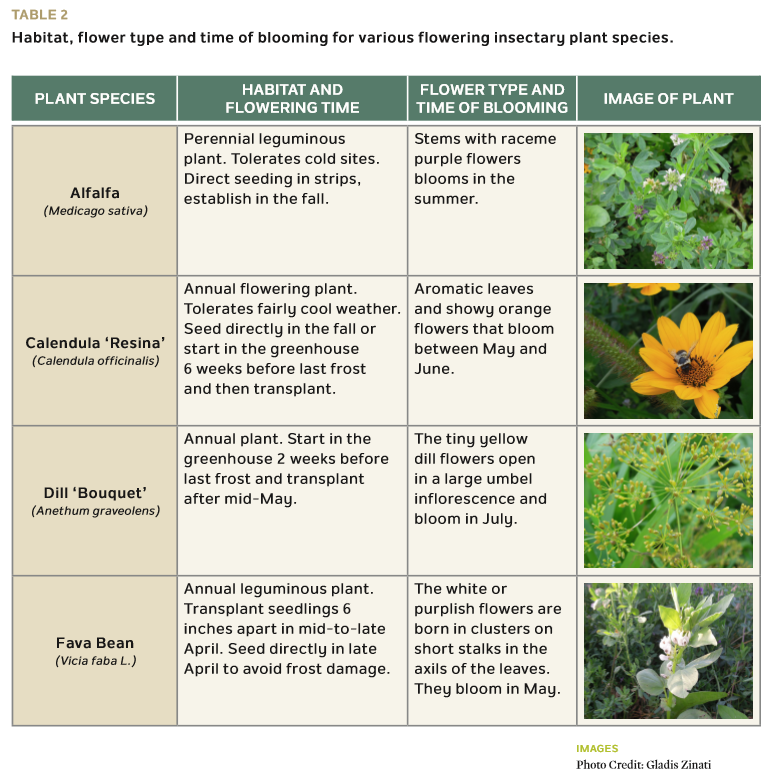 Refer to Table 2 to learn about plant classification, habitat requirement and blooming period. Cavanaugh, A., R. Hazzard, L.S. Adler. 2009. Using trap crops for control of Acalymma vittatum (Coleopera: Chrysomelidae) reduces insecticide use in butternut squash. J. Economic Entomology 102: 1101-1107. Choo, H. Y., A. M. Koppenhofer, and H. K. Kaya. 1996. Combination of two entomopathogenic nematode species for suppression of an insect pest. Journal of Economic Entomology 89: 97–103. Dively, G.P. and A. Kamel. 2012. Insecticide residues in pollen and nectar of a cucurbit crop and their potential exposure to pollinators Journal of Agriculture and Food Chemistry 60:4449–4456. Ellers-Kirk, C.D., S.J. Fleischer, R.H. Snyder, and J.P. Lynch. 2000. Potential of entomopathogenic nematodes for biological control of Acalymma vittatum (Coleoptera: Chrysomelidae) in cucumbers grown in conventional and organic soil management systems. Journal of Economic Entomology 93: 605–612. Hoffmann, M.P., R. Ayyappath, and J. Gardner. 2003. Effect of striped cucumber beetle on pumpkin yield. Journal of Entomological Science 38: 439–448. Hoffmann, M.P., R. Ayyappath, and J. Gardner. 2002. Effect of striped cucumber beetle (Coleoptera:Chrysomelidae) foliar feeding on winter squash injury and yield. Journal of Entomological Science 37: 236–243. Nordell A. and E. Nordell. 2010. Caterpillar vs. cucumber beetle. Small Farmer’s J. 34(2): 59-63. Reed, D. K., G. L. Reed, and C. S. Creighton. 1986. Introduction of entomogenous nematodes into trickle irrigation systems to control striped cucumber beetle (Coleoptera, Chrysomelidae). Journal of Economic Entomology 79: 1330–1333. Smyth, R.R. and M.P. Hoffmann. 2010. Seasonal incidence of two co-occurring adult parasitoids of Acalymma vittatum in New York State: Centistes diabroticae (Syrrhizus) and Celatoria setosa. Biocontrol 55: 219–228. Snyder, W.E. and D.H. Wise. 2001. Contrasting trophic cascades generated by a community of generalist predators. Ecology 82: 1571–1583. Williams, J.L. and D.H. Wise. 2003. Avoidance of wolf spiders (Araneae: Lycosidae) by striped cucumber beetles (Coleoptera: Chrysomelidae): Laboratory and field studies. Environmental Entomology 32: 633–640. Yao, C., G. Zehnder, E. Bauske, and J. Kloepper. 1996. Relationship between cucumber beetle (Coleoptera Chrysomelidae) density and incidence of bacterial wilt of cucurbits. Journal of Economic Entomology 89: 510-514. Zehnder G. 2013. Farmscaping: Making Use of Nature’s Pest Management Services. Available online at https://articles.extension.org/pages/18573/farmscaping:-making-use-of-natures-pest-managementservices. Excellent article. We have always planted to provide habitat for beneficial insects by simply making observations of what kinds of plants they are drawn to. This information provides more detail than our guessing. Thanks!